Another stop on the West Coast Flickr "Silk Road". This place has been photographed many times by people far more talented then me. 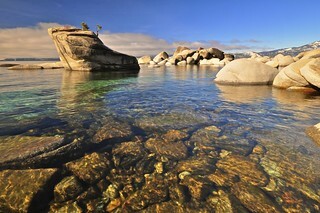 30 years in Tahoe, and until this winter I'd never heard of it. The shoreline is relatively clear now, so it's a little easier to maneuver. Yesterday it was overcast, but I decided to see what it looked like, hoping it might clear out a little (it had rained the day before). Set up the camera and hung out for 15 or 20 minutes, then wham! here comes the sun. Funny how 100 square miles of clouds can disappear in minutes. Most folks shoot this looking south, but I tried it this way, with a little side lighting instead. If you have been here and are planning on returning anytime soon, you might have to adapt a little. The water level is higher then at peak last summer. Rocks I was stepping on a month ago are now submerged. PS: there sure is a lot of trash down there. Plastic, bottles, cans, etc. That's as bad as I've ever seen at Tahoe. What's up with that? My wife filled a bag but it didn't make a dent - she's bringing a garbage bag the next time we go.